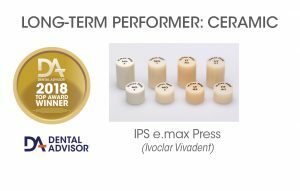 IPS e.max Press (Ivoclar Vivadent) is a high-strength, lithium disilicate ceramic used for anterior and posterior restorations as well as anterior three-unit bridges. IPS e.max Press can be overlaid with IPS e.max Ceram to optimize esthetics. This product received a 97% clinical rating. • Four dentists placed 671 IPS e.max restorations in 282 patients over a five-year period. • Three hundred eighty-one restorations were evaluated (Figure 1). • Sixty-eight percent of these were in function for five years while the remaining 32% were in function for less than five years (Figure 1). The restorations represented a variety of anterior and posterior crowns as well as inlays and onlays (Figure 2). • Before cementation the internal surfaces of all restorations were etched with 5% hydrofluoric acid gel for 20 seconds, then rinsed and coated with a silane (Monobond Plus). 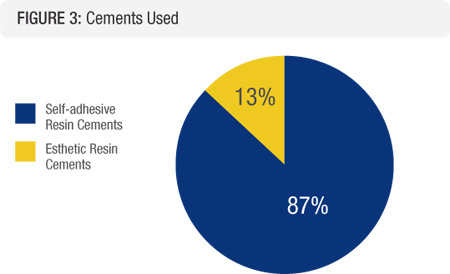 All were cemented with either self-adhesive resin or esthetic resin cements (Figure 3). Esthetics, resistance to fracture or chipping, resistance to marginal discoloration, lack of sensitivity, and retention were evaluated and rated on a 1 to 5 scale (1=poor, 2=fair, 3=good, 4= very good, 5= excellent). 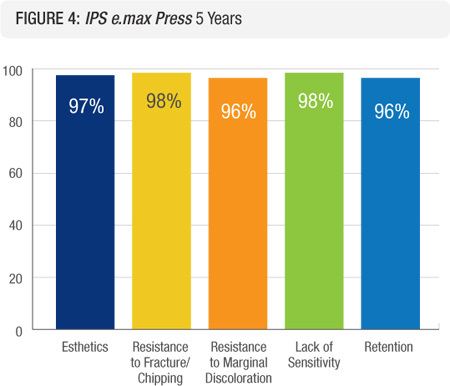 Ninety-seven percent of the IPS e.max Press restorations received a five or an excellent rating (Figure 4). The restorations were not only clinically acceptable but also of superior esthetic quality. Many patients remarked positively on the esthetics of the restorations. 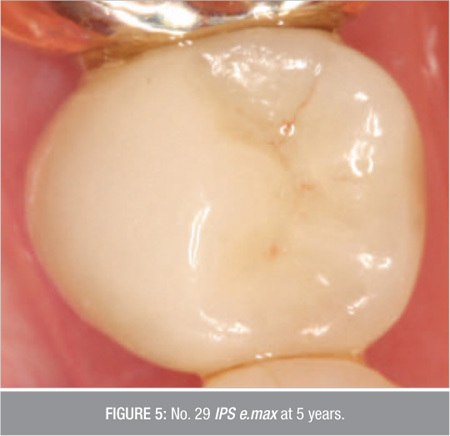 Figure 5 shows an IPS e.max Press onlay at five years. Only 6% of the restorations were slightly opaque and lacked sufficient translucency, which could be a function of ingot selection. 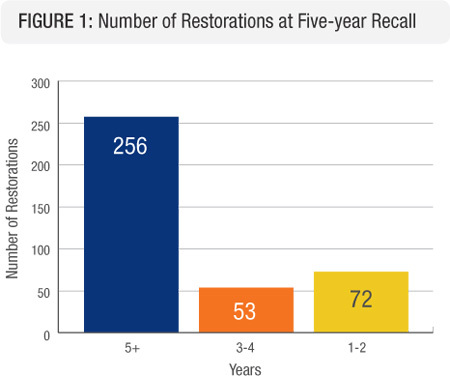 Of the 381 restorations evaluated, seven fractured and were replaced over the 5 year period (Figure 4). Only 1.5% of the restorations exhibited some chipping and these were smoothed and polished. Less than 2% fractured and were replaced. This fracture rate is less than half the average fracture rate of ceramics documented by THE DENTAL ADVISOR over the past 27 years. 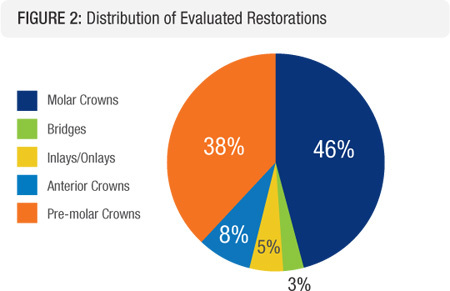 The lack of marginal discoloration of the restorations was excellent in 96% of the cases (Figure 4). Leakage at the margins is not just related to the fit but more to the bonding and the resin cement. In 2% of the recalled cases, some graying at the margins was noted but none necessitated their replacement at five years. Only seven cases (1.5%) of postoperative sensitivity were reported by patients (Figure 4). All except for one were mild in nature and subsided over time. Twelve restorations (4%) debonded and needed to be recemented (Figure 4). This debonding rate is similar to debonding rates of other all-ceramic restorations monitored over 27 years by THE DENTAL ADVISOR and is related to the preparation and the cement rather than the ceramic. IPS e.max Press has proven to be a very esthetic, high-strength, durable material with excellent clinical performance over the five years. Its performance has exceeded that of traditional PFM restorations as well as many all-ceramic restorations. 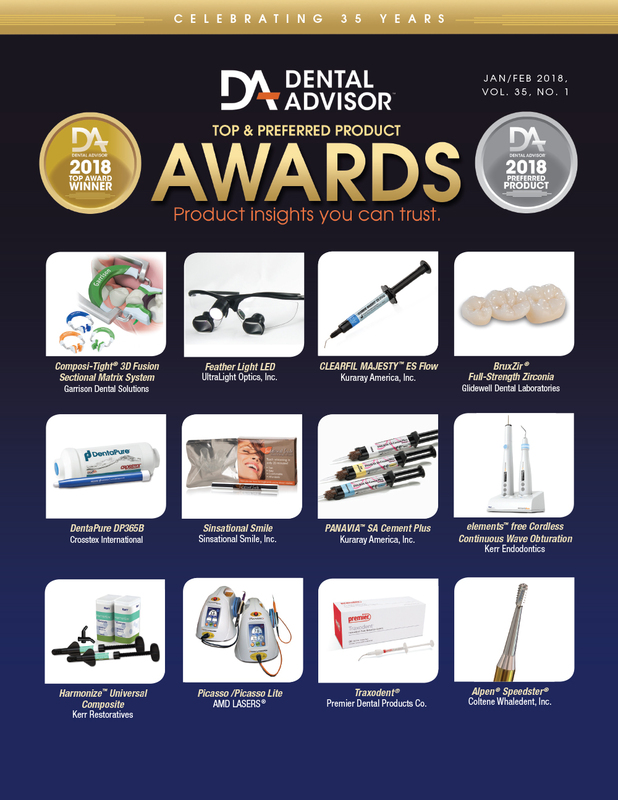 IPS e.max Press is highly recommended by THE DENTAL ADVISOR.